Zeke (Ezekiel Zirbel Thiessen) is in some ways not much different than many other young twenty-somethings. In others, he is exceptional – although maybe I’m biased. 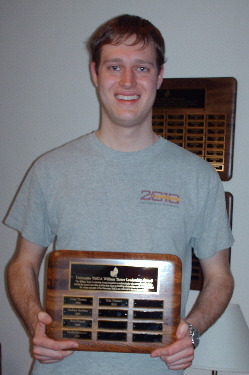 Zeke was honored recently by the University YMCA (University of Minnesota) with the William Teeter Leadership Award. The award recognizes “a student leader who exemplifies the quiet, behind the scenes leadership qualities that focus on relationships and ensuring that the values and spirit of the UY are reflected in day-to-day activities.” Zeke participated in Y Buddies and was instrumental in organizing immersion experiences. As a member of the Ministry Development Team, Zeke has brought much needed insight into what church is and what church does in the world. Zeke and many of his friends are Christian and, while they talk openly about their faith, they have little time for the church as it exists in this time and space. Rather than doctrine and orthodoxy, Zeke believes the measure of church is what it does in the world – specifically the relationships that are built and nurtured while actively being in the world. No fanfare – not needing to be constantly stroked – just being in God’s good creation with God’s children. It strikes me that we all could stand deep discussion about what “BEing” church entails.